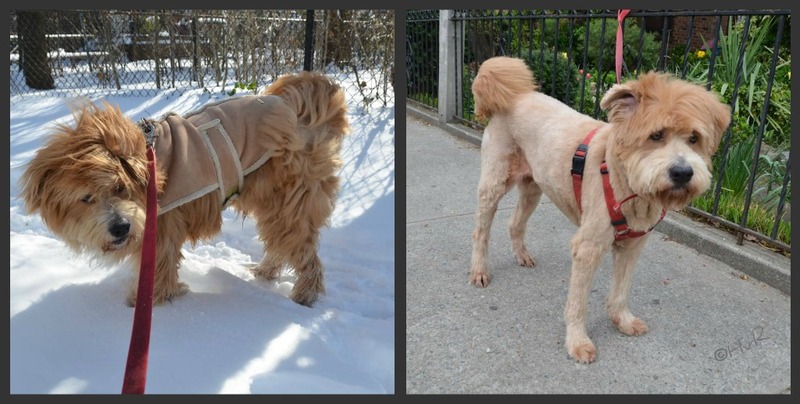 Photo of the day: MY DOG NOEL’S $178 NEW YORK HAIR CUT! MY DOG NOEL’S $178 HAIR CUT: The saga of my dog’s haircut. Living in New York with a large 60 lb. sheep dog/terrier mix dog isn’t easy…especially if you don’t own a car. So the saga begins. It’s time for a hair cut. Noel had become way too fuzzy and matted from a winter’s worth of rub-downs from playing in the snow. First obstacle: Most of the groomers in this neighborhood, despite being a garden/large dog area, won’t groom large dogs. If they do, they do a lousy job or totally freak out or injure the dog. Second obstacle: When you do find a groomer – how do you get there? Most new Yorkers don’t own cars, much less even know how to drive. Noel has become to be mom’s dog. They are perfect company for each other, two older ladies growing old together. Noel is 13, mom is 87. Mom finally found ‘Le Pitou II’, a groomer that didn’t scar Noel emotionally as well as physically in the neighborhood of Forest Hills, several miles up Queens Blvd. Next step is to cajole the car service into letting me bring a large dog, by providing our own blanket to shield the car. Noel is a docile car rider so Noel is no problem. As we arrive at Le Pitou groomers, the good sign is Noel was happy to be there. “It will take a while, four hours.” Ok, I thought, she’s practically a walking shag carpet, four hours sounds reasonable. Rather than taking the subway back home, I decided to photograph the mansions in nearby Forest Hills Gardens, a private gated community, one of America’s first planned communities. The day went from sunny and warm to cold, foggy and chilly and by 5pm I was more than ready to pick up Noel. “Two more hours,” I was told. Tired from being the wandering photographer I took the subway home. 7:15pm the phone rings, Noel is ready for pick up. Back on the subway I go for the quick ride back to Forest Hills. $93 later, Noel looked adorable and was happy as a clam. I tipped the groomer $20 cash, without really looking in my wallet. Next urgency on the agenda = walkies! After walkies it was time to go through the same song and dance with the car company: “Yes, she is 50+lbs, but she is very docile. No, she doesn’t bark. Yes, she is clean. I have my own blanket.” Instead of the $18 charged in the morning – now the cab ride was $25. Ok, fine. I said I would meet the car outside the groomer. While waiting, I checked my wallet. I only had three $5 bills. I quickly looked for a nearby bank…none to be found in sight. (I will not go to a bodega’s ATM, many of them contain ‘card readers’ that steal all your info.) So, with 15 minutes to spare, I raced down the blvd. to find a bank. The nearest one was 10 blocks away and Noel was getting tired. After six blocks, the cell phone rings “Your car is in front of the groomers.” Now I had to race six blocks back to the car. While running, I called mom and asked her to meet me on our corner at home of 46th Street and Queens Blvd. (the Manhattan bound traffic side/coming from further in Queens) with a $20. bill. Fine all settled. I try explaining to my Russian driver whose English was limited and therefore a bit overwhelmed and perplexed at my hyper state explanation. Down the blvd. we go. All is fine. We arrive at 46th/Queens Blvd. – no mom. I look up and down the street – no mom. Akward! I plead with the driver to cross the blvd to a nearby Chase bank. (I can hear on the car radio his dispatcher wondering where he was.) I offered to leave my expensive camera in the car, while running into Chase’s ATM to withdraw $40. I came out a gratefully handed him the whole $40 and apologized and thanked him profusely. Where is mom?! (No she doesn’t have a cell phone). I dragged poor tired Noel up and down the blvd = no mom. Her phone at home doesn’t answer. I try going to my house – no mom. I go to mom’s house – not there either, I take Noel back to my place so she can rest and drink some water and have some cookies. Back out to hit the streets to search for mom. With no other logical places to look for her I start to get panicked thoughts of dread, she got hit by a car, mugged, etc. I decided to cross to the Queens bound side of the huge blvd and search there. As I arrive on the other side, there comes mom, slowly making her way with her cane, looking worried and perplexed. “Where were you? !” we both asked. $178. New York hair cut!